A day’s walking is a filthy thing. I propose something new for us as a Christian community at the First Congregational Church of Webster Groves. Really, it's just something to be renewed, but we need to approach it as if we have never done it before. That is, to fearlessly and actively seek new opportunities for hospitality and love with people who do not believe or practice faith in the same ways we do. We need to recognize and energize around the understanding in our sacred texts that loving the stranger is our greatest goal for faithfulness. On Friday afternoon in New Zealand, you know by now, an armed white nationalist entered mosques in Christchurch and murdered dozens of people. On Friday afternoon in Ballwin, Missouri, I went to the Daar Ul-Islam mosque of the Islamic Foundation of Greater St. Louis for an interfaith gathering reacting to the Christchurch attacks. After about half an hour of greetings from leaders of Jewish and Christian communities and acknowledgments from the host imam and other Islamic religious leaders from the area, those of us gathered adjourned to a series of informal greetings and embraces with tears and words of affirmation for one another. Circulating around the room I ended up hugging my friend Imam Ibrahim Hasic twice, catching up briefly about our families and communities, and realizing that we don't make nearly enough time for each other outside of work. As I left the mosque, I was keenly aware of the three uniformed men who were providing security and traffic control. It reminded me of a conversation I'd had, two days before. I had attended a clergy meeting in which a Christian minister and a Jewish rabbi reflected about their communities' experiences with an Islamic center, the three communities together developing a program for little children to teach them about their traditions' mutual values and different ways of expressing those values. The Christian mentioned the importance of a security guard, something he had not considered when he had first imagined the program. 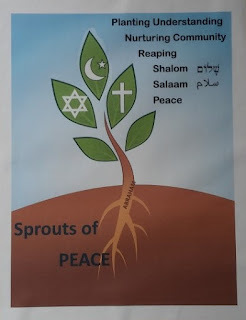 At every gathering of the "Sprouts of Peace" program, there is uniformed, armed peace officer for everyone's protection. There came to my mind my words with church members, after shootings at churches that happened a couple of months ago, that arming our greeters would be foolhardy and that keeping our building's doors unlocked and unguarded is part of our hospitality. I am not sure I was ever quite so profoundly clear about the privilege my religion and my religious community's historic identity (as a liberal Christian group, dreaming of diversity but definitely white in the overwhelming majority). At least as far as being targeted for being counter to the culture of the mainstream is concerned, First Church is safe from the threat of terrorism. The only possibility I see, of a need for a guard at the door, would be in a case like that which our presenters were providing, in which we might be sharing programming with a predictably targeted group. On that Wednesday, I reflected about how, on Monday, I had spent the morning in a gathering of leaders from many faith traditions around a table sponsored by the Jewish Community Relations Council. We were discussing with Prof. David Oughton of St. Louis University the history of Christian anti-Semitism and just how intractable it can be. I ached to have a similar discussion among the people of my church and, by extension, my community generally. I longed to remind them that we are not blameless, even if we have distanced ourselves over the past many decades from the vilification or demonization of these others. The mere statement of suspicion by one faith-based voice against another implicates the first in the persecution of the other. First Church has concentrated a lot, over the last few years, on anti-racism and the importance of recognizing our unintended complicity in the preservation of racism and racist expectations. We have heralded our church's history of promoting civil rights for people of different colors and cultures than our own. We haven't, however, looked as long and hard lately at the ways in which we perpetuate prejudice against other religious groups, either actively or passively. Oh, I make our Confirmation students, their mentors, and teachers attend worship, prayer, and meditation gatherings at Jewish, Islamic, Baha'i, and Buddhist meeting places nearby; I assign them the task of attending services in at least two other Christian communities. (And I know some of the adults of my church go to bar and bat mitzvah celebrations, and many attended services at nearby synagogues, the Shabbat after the Tree of Life massacre.) But there needs to be a voice and example coming from among us, active and fearless (even if that fearlessness is based in entitlement and privilege). This voice may be, sometimes, even prophetic in affirming to our wider community those people who believe or practice faithfully, but differently, than we do. We can face hatred and ignorance with love. We are privileged enough to be able to do this without fear. When we establish new love, when we cultivate our friendships across religions as well as across race, when we invite others into new relationships and networks of care and concern, we generate a process that can bridge the chasm of cruelty, of fear, of hate. If we are silent and if we do nothing, we are implicated in the murderous actions of terrorist cowards. We can and must fearlessly and actively seek new opportunities for hospitality and love. We can and must change the course of our culture because we change our own expectations of ourselves and of others. We know the price that will continue to be paid if we do nothing. Loving the stranger is our greatest goal for faithfulness. Yes, the best way forward is to generate relationships and networks of care and concern that prevent Fridays and other days like the one Christchurch just experienced. This was true on Wednesday, as my clergy meeting heard about those Abrahamic young people in the "Sprouts of Peace" program. It is just as true on Mondays, as my colleagues and I are discovering monthly. It is true, every day, and will be always. COMMENTARY: The prophet Jeremiah was convinced that the overthrow of his nation’s government by a foreign power was no accident: it was God’s judgment. His people, he announced as speaking for God, had chosen to ignore mercy and to favor wealth. Their greed got them into the political mess they faced and the historical exile they experienced, as the nation’s ruling and merchant classes were carted off to Babylon for discipline and servitude. Six centuries later, Jesus was able to draw parallels between Jeremiah’s humiliated government and Jewish leaders in his own time who cooperated with the power of Rome in occupied Galilee and Judea. Note in the Luke passage the intentional linking by Jesus between the successful of his own time with those who were the cause of Judah’s judgment in Jeremiah’s time. He does this by referring to the cooperators as if their ancestors were those who were sent into exile, six hundred years before. Indeed, the Beatitudes as spoken in the gospel according to Luke when laid side-by-side with Jeremiah’s preaching ring very familiar. COMMENTARY: Written in or about the year 54 CE, what we call Paul’s first letter to the Church at Corinth is actually the third that Paul wrote to the Corinthians. The first two having been lost to the ages, this one offers correction to misperceptions or misconceptions those Christians had had about their new faith. In the letter Paul demonstrates their misapplication of what he had written before. In this passage the misapplication has to do with the central tenet of the Christian faith – Christ’s resurrection. Paul weaves an argument together out of Jewish thought and Greek thought. His argument is sublimely logical, like arguments of Plato or Aristotle, but his premise and his conclusion are like those of the ancient rabbis. He focuses on a predicted end-of-history event, the raising of the dead, when God will pass judgment on all people. This resurrection will provide for the righting of historic wrongs. It will reverse the fortunes of those who lived unjustly but without punishment and those who lived righteously but without mercy. Jesus’ own resurrection has been proof that the day is coming, Paul says, and the arrival of that day is the lynchpin of Christian faith and proclamation. This claim was as problematic for his Corinthian audience as it may be for us today. There is no physical evidence of Christ’s resurrection, no glorified Jesus who is visible anymore. There is only testimony and theological imagination. Paul counters those who claim to practice this faith without believing in a coming resurrection by suggesting that the dubious are calling him a liar. Today is the Sunday of Presidents Day weekend. Abraham Lincoln and Charles Darwin were both born near this day. Darwin and Lincoln, those two voices which have had the most defining effect for America in our history, were born on exactly the same day – February 12, 1809. It’s also African American History Month, and today is our special observance of Science and Technology Sunday. And even though it may seem as though we’re forcing an issue just because of the confluence of those coincidences, I still was inspired to consider that confluence. After all, all of life can seem sometimes as if it’s just a confluence of coincidences that we’re trying to make sense out of – as if the combination of circumstances in our environment are forming a vortex, and we are at the center of it, trying to imagine what all of the randomness means, like Alice in the Rabbit Hole. Our scriptures for today seem like part of it. Jeremiah and Luke offer beatitudes and curses; Paul scolds the Corinthians (interestingly) not for not believing but for not believing enough! And, I’ll tell you, the Psalm of the day, which doesn’t appear at all in this worship service, is the first of the Psalms exalting the faithful for being like well-watered trees full with leaves. Four disjoint sayings, except that Jeremiah and the Psalm both share similar tree imagery, and Jeremiah and Luke share a similar motif of blessing and cursing. So you can imagine, I find that reading scripture passages together can be kind of confusing and feel kind of random unless they can be considered with a certain topic. And with the timeliness of considering together both how some of our citizens have been historically mistreated (because of Black History Month and Lincoln’s birthday) and what we do with what we know (because of Science and Technology Sunday and Darwin’s birthday), I thought I might be seeing a glimmer of something meaningful shining through Paul’s remonstrance of Corinth and Jesus’ beatitudes in Luke. Blessed are you when people hate you, and when they exclude you, revile you, and defame you on account of the Human One. If the dead are not raised, then Christ has not been raised. If Christ has not been raised, your faith is futile and you are still in your sins. Then those also who have died in Christ have perished. If for this life only we have hoped in Christ, we are of all people most to be pitied. Those two portions really stuck out to me with their emphases of suffering and death and breaking their strangle holds on our existence. I thought, That’s where I want to go with this. So, on Facebook I asked how other people encounter Paul’s assertions in First Corinthians 15 about Jesus’ resurrection and the coming resurrection of the righteous. Where and how have you met (are you meeting) the Messiah? I asked. Another way to put this, I said, might be to ask, What is real for you about your faith? If Jesus was not physically and spiritually resurrected he is not Jesus the Christ, the Messiah! I, because of the witness of those who where there, believe in the full resurrection of Jesus. And that the promise of eternal life in Christ is real because God’s promises are real. I have a faith that says that those who die in Christ shall live again and that this spiritual place is a communal gathering of those who have also lived and died in Christ. So to answer the question, it is important because I believe in a faithful God, who has never failed, lied or not come through. I believe that there are many metaphors in the Bible, but that the bodily and spiritual resurrection was testified to by the Apostles and to their followers whom I believe to this day. A medical professional said, There is a major difference between resurrection and resuscitation. Resuscitations occur frequently in ambulances and hospitals around the world. Jesus’ resurrection is important because it set a precedent. He was the “first fruit” and because Jesus did we have the testimony of this happening in God’s Word, we have faith that we will rise again after death too new life (and not just be resuscitated to live the same old life). [A Japanese pastor said that she asked] for help with [her] sermon on Twitter! She asked the question, “How do you believe in the resurrection of Jesus?” and got 73 responses to her multiple choice answers. Answer 1: I believe ultimately in the resuscitation of the Jesus body – 30%. Answer 2: I believe in only idea of the resurrection of Jesus – 15%. Answer 3: Not exactly sure what happened but believe in the meaning of the resurrection of Jesus – 55%. One church member replied, I honestly don’t have a clue about whether there was a resurrection... Jesus presented to us a way of living. I think the bedrock fact of the resurrection is that Jesus showed up and changed people... And the bedrock meaning is that God is ultimately on Christ’s side, evidence to the contrary sometimes notwithstanding. To me, it doesn't matter if Jesus rose bodily or in Spirit. What matters is Christ made known that he conquered death itself and that there is life beyond what we know on Earth. Quoting an Easter sermon I preached about five or six years ago, one church member said, I think of the resurrection as “Jesus loose in the world.” It had a big impact on me and how I think about the resurrection. I find Christ’s presence in the often surprising evidences of guidance and providence in my and other's lives. A person can be clever and far-sighted in planning one’s own life, but the way things fall into place (or don’t) outside of one’s control does create story-arcs that, to me, are amazing examples of Christ's presence. I think about the resurrection this way: I think that, as I’ve said at other times, If it could happen for Jesus, it can happen for us. Resurrection, whatever it is or means, indicates the possibility of new and glorified life in God. We claim to have good news. We use the word gospel a lot, but it can sound mysterious. So, let me remind you that, when Paul or Jesus said the word we say when we say gospel, they said, “good news.” So, that’s what we have: good news bringing meaning and relief, salvation and life, despite the strangle holds of suffering and death. That is the meaning of resurrection. Even so, even for all his concentration on our good news, Paul points out that it really is no news. Because of the resurrection of Jesus, he says, and Christ’s glorification by God, we don’t have a Jesus with whom we can make physical contact anymore, the way the apostles once did. This can be a problem, he admits, because we may then believe in Jesus’ actual resurrection, but we may imagine that it was a one-off and that he would have been the only one who gets that treatment. No, Paul insists, Jesus was only the first. A day is coming... and you can read about what he envisioned for the rest of us in my commentary. But people then weren’t believing it. They were coming up with rationalizations and explanations for their loved ones dying and not being raised. They were doing the things that we do: insisting that people live in our hearts long past their earthly lives, and that this is what lends them eternity. Or that their spirits are still among us, and that this is what proves their eternity. Paul said, No, that isn’t enough. And you and I know: Our sentiments are sweet, but they’re cold comfort. When you think about what he saw in daily life – its cruelty, its futility, and itscrushing effects on some, while others either take for granted their affluence or didn’t take it for granted and insulated and isolated themselves from the suffering that is so often the expense of their luxury. Paul was not satisfied with some sort of “pie in the sky when you die by and by.” Paul insisted that, if there was going to be justice, it had to be real. If, therefore, resurrection happened for Jesus, it has to happen for us too. Paul, not having lived through the Dark Ages or the Enlightenment, hadn’t come to any sort of notion about democracy or anti-slavery or workers outnumbering their masters and casting off their chains. He didn’t know about such things, except that invariably, when he saw the underclasses rebelling, they were subdued and subjugated again and again. What he knew was that there came now this good news from on high, a good news that he preached: that the Creator was redeeming the world and that, eventually, those same sufferers and their suffering children would be saved and justified, and their oppressors and all those who did nothing to ease their burdens made to suffer for the sins they committed in this life. And even without Jesus in his former flesh restored to assert the authority and glory of God, that measure of no news, that He’s not here, still was good news for Paul and other Christians. Keep your eyes on the prize, Paul instructed the Corinthians. Accept no substitutes. This was a problematic assertion back then, and it is a problematic assertion in our own time. No news can be dangerous in a world that is growingly more disposed to evidence. The development of science in human history has led us to draw our most assured conclusions about the patterns around and among us. We do this through evidence and, in particular, measurable, quantifiable, repeatable evidence which reveals to us laws of nature and of physics which are only ever poetically referred to in scripture, if they are referred to at all. Religion, meanwhile taking the sometimes-deadly combination of a lack of evidence (no news) and an abuse of the evidence we do have, has often faced contradiction (and continues often to face contradiction) either with force or with denial. Our refusal to submit to science’s superior knowledge has always led to exactly the suffering we are supposed to prevent. And a share of that suffering is beginning to affect not only poor people but affluent people also. Up to now, we’ve been able to keep the world pretty well divided between the poor and the affluent (I’m not going to say rich, because most of us don’t think of ourselves as rich). We have been able to isolate ourselves from the kind of despair and misery that exists in two-thirds of the world, and maybe even more than that. We have been able, through our advances, technological and otherwise, to separate ourselves from the pain of existence that people suffer through starvation and famine, or through war and suffering, or through corruption. But now we’ve got global warming. There was a time when affluence could provide insulation from suffering, but no more. Now, we’ve really done it. Poverty has always been accompanied by violence or destruction, but even what we might consider a small amount of affluence has provided protection from misery. Technology, even the simplest or most basic, has borne the evidence of this. The generation and widespread distribution of electricity, as well as the development of the internal combustion engine, of batteries, and the host of means of providing energy to masses of people have lifted humanity up, as far as our relative standards of living are concerned. But they have brought with them war and corruption and pollution. The advancements in medicine and hygiene, the purification of water, and the development of chemicals for use in everyday life have likewise made possible longer life expectancies. But what is the value of a longer life if violence continues and injustice persists? Let me be clear. If you are poor, the best you can hope for in the face of violence and corruption and pollution is that you might be able just to live with it. But if you’re affluent, you have the choice of either fighting it or fleeing it. You can get away. But the way things are today, fight or flight may not exist as an option much longer. The rabbi Jesus and the apostle Paul call to us with the voice of the Holy Spirit, reminding us that no news is good news! We may not have physical evidence by which to prove our faith, but the truth of our faith is undergirded in a belief that the impossible for one is possible for all. If it could happen for Jesus, it can happen for us. Resurrection, whatever it is or means, indicates the possibility of new and glorified life in God. And God did this, intervened, raised Jesus. And God will raise us too. And whether that’s a day of justice at the end of time, or today when we presume to follow in Christ’s footsteps and seek new and glorified life in God: that’s our choice. Resurrection, whatever it is, whatever it means, indicates the possibility of new and glorified life in God. I’ll tell you why I think this way. If there are so many who are suffering in this life, especially young lives being wasted as Pilate intended to waste Jesus’ young life as an example for others, then certainly in that way if it could happen for Jesus, it can happen for anyone. So, it may be that our only hope is resurrection. And here, we soar beyond the limits of what science can tell us. Here in Christianity, we soar beyond the limits of what science can tell us! From science you will only get facts and figures from which you can make premises and assumptions about future outcomes. From religion, and especially Christianity, you get promises of life and truth and beauty in love. Oh, so much love! That’s when no news is good news, by the way... when you don’t have the slightest evidence in the world and its quantifiable, measurable results, but you have a promise, a promise you can trust. That’s when no news is good news. And so, I don’t have the evidence to give you, to show you that Jesus was bodily resurrected and lives glorified at the right hand of God. God sort of prevented this, and yet we have that knowledge and understanding that, once it did happen. And it can happen again. No, it will happen again. How may faith, hope, and love abide? Faith = I am bound to you, either by promise or by grace. Hope = Better things are coming, and redemption is near. Love = Unconditional, undifferentiated embrace with no requirement of reciprocation. When I started researching for this sermon, I was intrigued by the insight that the name of the town where Jesus’ home was throughout most of his ministry, Capernaum, is a word in Aramaic (the language Jesus spoke) now associated with chaos and meaninglessness. I was fascinated that he should have moved from Nazareth to Capernaum, from the place where he spent his childhood to that haven of insanity. Faith = I am bound to you. Hope = Better things are coming. But because “the greatest of these is love,” that’s where I am going to try and concentrate most of our focus, today. It’s kind of nice to have so much in our readings concerning love, here so close to Valentines Day. I can’t find evidence that that is why we just read 1 Corinthians 13, but it feels almost as if we’re reading this in order to prepare for February 14. Love, Paul argues, is the necessary basis of every spiritual gift he has mentioned in chapter 12. He continues by asserting that, if you have any spiritual gift but you lack love, then you don’t actually have the spiritual gift. If all that is happening is some kind of personal gratification or reward, then what you have cannot possibly be love. Love is a divine quality, rooted in the Holy Spirit – chesed, lovingkindness – a product of grace, a byproduct of promises kept, pointing toward a potential in human beings that we rarely achieve. Love (what Paul called, agapé) is the stuff of heaven, abundantly available on earth, and fundamentally irreplaceable, but scarcely employed. When it happens, it is so unusual that it stands out. Being selfless and unconditional, it is starkly different from what one is accustomed to seeing produced from out of human beings. When love is accomplished successfully, it draws amazed attention. For example, the real estate developer Candice Payne in Chicago, this past week, recruited other merchants to provide housing to people who had been living in tents but whose propane fuel had run out. Together, Ms. Payne and those other citizens put up eighty or so people in sixty hotel rooms on the South Side. She and her husband paid for a third of them... and not just for one extremely cold night but for three. That’s a nice example of how to remedy a situation in the immediate. But what if you know that remedying the immediate doesn’t actually fix the problem? What if you know that the problem really is rooted more deeply? You know, the old metaphor of pulling drowning people out of the river and then realizing that the solution is to prevent them from being thrown in, in the first place..? In Utah and New York City, and other places, agencies are dealing with a level of homelessness in our country the rate of which is only exceeded by that which existed during the Great Depression. There are two prominent ways of dealing with homelessness: Housing Ready is the most common, but there’s also a new concept called, Housing First. Housing Ready provides homes to homeless people who have undergone training on how to maintain a healthy and stable household. They learn skills like balancing a checkbook and cooking simple meals and interviewing for jobs, sometimes responsible parenting, and those sorts of things. Some are given avenues toward becoming sober. There will usually be some transitional living situation provided as a first step toward affordable or even free housing. But the idea is that, once you have completed such life skills development, then you can qualify for a place to live. Such programs can have as much as a 40% success rate among the chronic homeless, but it is usually considerably lower both for the chronic and the persistent homeless person. Housing First puts people in stable housing situations regardless of whether they have been taught or acquired life skills for stable living, before their drug or alcohol use is abated, providing condoms and clean needles if needed, even before their mental health care may have been normalized for them. St. Louis journalist Aubrey Byron reports that a Housing First program in the state of Utah reduced chronic homelessness there by more than ninety percent in the decade from 2005 to 2015. It hasn’t had a similar effect in other homeless populations, such as those who are persistently homeless – say, for more than three months but less than a year – but the results of this type of intervention for the lives of chronically homeless people, newly housed after perhaps dozens of years, are really remarkable over the long term. They are shown to result in sobriety, lower per capita living costs (most notably because of a lesser need for emergency services and intervention of law enforcement), stabilized mental health, and reunion with estranged family. I have learned over and over again that when you listen to somebody’s story with an open heart, walk in their shoes with them, you can’t help but love and care for them and want to serve them. Now, the model isn’t a panacea. It has a magnificent success rate for the fifteen percent of homeless people who are the chronic homeless. But it’s an amazing start. Persistently homeless people benefit from somewhat different approaches. Utah’s latest initiative for persistent homelessness, which they are boldly calling “Homes Not Jail,” was begun in 2017 by the state with the cooperation of a major shelter in Salt Lake City. It’s still too early to estimate its level of success, but you get a sense in the naming of the project what will be the measure of its success. Love = Unconditional, undifferentiated embrace with no requirement of reciprocation (which provides a basis for the other two). In consideration of Paul’s encouragement to other Christians to practice the unconditional love they have received from God, and to base their faith and hope upon it, it should come as no surprise that the Church of Jesus Christ of Latter Day Saints, the Mormon church, has been a major funds provider and advocate for these initiatives in Utah. The Mormons are proving to be significantly pragmatic in their approaches to homelessness and addiction, not placing restrictions, impediments, or expectations upon the recipients of their benevolences. Can we love like that? Would it be possible for us, even as individuals, so to set aside our concerns about appearances, or our presumption about others’ laziness and lack of motivation or lack of will, that we might love others in the way that God loves us? There is something in the way that God has acted toward us, something in our life that has caused us to perceive God’s favor, something in what we have been taught (maybe) that says that God loves everybody and therefore God loves us. Even if we are not entirely satisfied with the present outcomes of our lives or the circumstances in which we may be living at the present, there has been a time, a blessed time that we cherish, when the goodness, the love of God was so readily apparent that we ended up here. Or else, we’ve been told that if and when we’re in trouble, we ought to show up here, because this is where God will be. This space and this place, what I say, what we do, how we experience time here are designed to mitigate, to remove the usual daily obstructions and seemingly endless distractions of our attention from the Source of blessing. We know that, and this is why we are here. then, mustn’t there be some kind of something that we could do that would move those qualities of faith and hope and love from within these walls to beyond them! This is a challenging proposition, I know, because when we read that story from Luke, about when Jesus upsets those other worshipers from his hometown, we may be led to wonder at just why they got so angry. But it has something to do with what he was saying to them. When he says, “This prophecy is fulfilled in your hearing,” Jesus directs the attention of his audience to the Isaiah scroll he has just read, about the year of the Jubilee – the poor have good news, the captives are released, the blind now see, the oppressed are free. But they don’t listen, fixated as they are on what has become of their native son. So he points out to them that they have become distracted from the message of the prophet: They are potentially the fulfillment of God’s longing for all people to enjoy the benefits of the earth’s abundance. You’ll recall, they had just requested that he do among them the kind of things that he had done in other places, especially in Capernaum where he had taken up residence. His response, which was based on what he had just read to them from the prophet Isaiah, was to say, in effect, that he didn’t belong to them; his hometown was heaven. And so was theirs. And if they would just act like it, imagine what would be possible! He was proclaiming the Good News, and this was to be good news for everyone. Because heavenly love cannot be localized. What we do here on Sunday mornings celebrates faith, hope, and love that have to abide as heaven abides – in, with, and through the earth. What happens in Vegas may stay in Vegas, as they say, but what happens in First – that stuff of the Spirit, the Holy Spirit – must not stay here. How may faith and hope abide without love? And how may love possibly abide in just one place? I want to go back to what I said at the beginning of this little talk and reassert it, because it really is at the heart of what we are about – as individuals, as an organization, as the Church – and that’s love. Love is the necessary basis of every spiritual gift. If you have the gift but you lack love, then you don’t actually have the gift. So, how shall any of these abide – faith, hope, or love? I promise you, the only possible way is that we keep returning to the Source of all three, and that we return persistently to the One who introduced us to them in the first place, introduced us so that they consisted of reality and meaning. This is how you do it. You find it here and then share it. You take it out, and then you bring it back, over and over again. I’m going to take a moment of pastoral privilege here. Please, grant me your patience and grace. I think that it ought to be impossible, this week, for preachers across our country to address the good news of Jesus Christ without also addressing the matter of mental illness, and especially the matter of mental illness combined with the ready accessibility of military-style firearms. Here is how I am facing the matter of mental illness in the light of the gospel, today. This I offer as a person of faith – and by that I mean not only faith in God but also faith toward other human beings as children of God. I also offer it as your loving pastor. We are seeing over and over again in the media what happens if an opportunity to do serious harm to others is not prevented. We see over and over again in our personal experiences what happens when mentally ill people decide to do harm to themselves. We are repeatedly broken and heartbroken on the individual, communal, and societal levels. Statistics have proven futile for making this point. And the present blaming of the FBI for the incident in Florida rings of scapegoating societal sin rather than facing our actual problem. Furthermore, more accurate recordskeeping and registry, by now, will likely only create another futile bureaucracy. So, to me, much of this moment in history seems simply absurd. If mounting numbers of dead schoolchildren and churchgoers and countless others in public venues only serve to polarize us, making the resolution of our collective problem still more improbable, then perhaps we deserve what we are facing. But concerns should not remain unspoken. We organize educational opportunities around what to do when an “active shooter” enters our schools, public spaces, and places of worship. Meanwhile, newscasts report about mental health professionals active in our schools, seeking to soothe the anxiety students are having just showing up for class. It is incumbent upon Christians that we offer mercy, compassion, and healing. These are the qualities given example in the Pioneer and Perfecter of our faith; indeed, these are examples of faith itself – not belief, but truth, faithfulness, mutuality, love. However these qualities may take form in any of us – as simple comfort and the binding of wounds, or as personal examination and action, or as advocacy for political and societal change, or even as ones preparing our communities for what feel like inevitable emergencies – our consciences should be telling us that such suffering as we are witnessing on the part of victims and perpetrators needs to come to an end. The potential gifts of troubled people should not be underestimated. Poets and playwrights, preachers and activists and politicians, indeed the foremost among us in every walk of life, have often been the same who have experienced or are experiencing challenges with perception and acuity, or depression and addiction. As I have spoken with many of you in the past, and as I found myself mentioning to one of you, this very week before the incident on Wednesday took shape, our religion has such a rich history of the positive contributions of people who obviously experienced serious episodes of mental illness, breaks from what the rest of us consider reality, but who were brought back from the brink not only by their faith in God but by the faith of their God in them and by the love of their families and friends! I refer to people like Noah the alcoholic and Abraham who heard voices telling him to do harm to his own child and Mary Magdalene who was relieved by Jesus of seven demons. How can we refuse to make our world safer for such people and our care of them better? The obvious answer to me is that, if our rights and privileges are endangering ourselves and others, then we make sacrifices of those rights and privileges for the sake of ourselves and those whom we love, or at least of those for whom we are responsible. You may draw other conclusions, and I am prepared to understand that some compromise would be necessary, but – in the interest of mercy, compassion, and healing – at this moment I say, I am prepared to part with a right that, admittedly, I have never exercised in order to protect the innocent. As a private citizen I will pursue this course. As a person of faith I will persist in that faith based in mercy, compassion, and healing. As a clergy person I will invoke the Spirit of God to act on our behalf to help us together discover the path through this valley of the shadow of death. And as your pastor pledge to you that I will keep and bear you, lovingly and without judgment, for neither of us can live without the other... at least not genuinely. So, now I’ve mentioned the matter, I’ve taken my moment of pastoral privilege, and that is all for now, except my request of all of you that – no matter whether or not you agree with me, please treat one another gently in speaking of this together, bearing in mind your oneness in the Holy Spirit, the loving heart of Jesus Christ, and the grace of the Creator in whom you are working out your salvation. 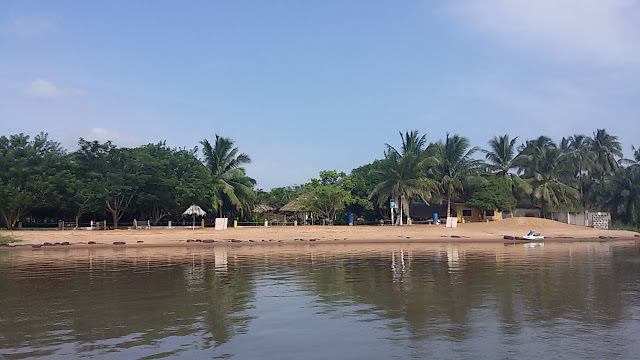 Sunday night at dinner, the hospitality manager of the Holy Trinity Spa and Health Farm noted to me that the Denoons had not yet had the pleasure of a boat tour of the Volta River. I knew that Gwen had been looking forward to it and we adults were interested. But I also knew that Gershon wanted to get on the road early on Monday, because on our way to his hometown of Hohoe we were scheduled to tour the Akosombo Dam - the first hydroelectric power plant in West Africa which yet today provides electricity to almost all of Ghana and Togo. I told the observant staff member that we had hoped to have a boat tour, but that we needed to be able to eat breakfast early and get on the road immediately, to our next destination. He then suggested that we combine breakfast with the boat tour. So, how could we say no! We packed our things on Sunday night and rolled our baggage out to the Reception Desk by 7:45. We skipped the coffee machine so that we could get underway by 8... and we were. The pilot of the catamaran and the manager seated us and wedged a table between us with three English breakfasts, fruit, three liter-size bottles of Bel Aqua (the local drinking water), and a tea service equipped with many packets of coffee. Next, Amos was properly introduced. He would be our pilot. He was a native of Sogakope and had grown up on the river. 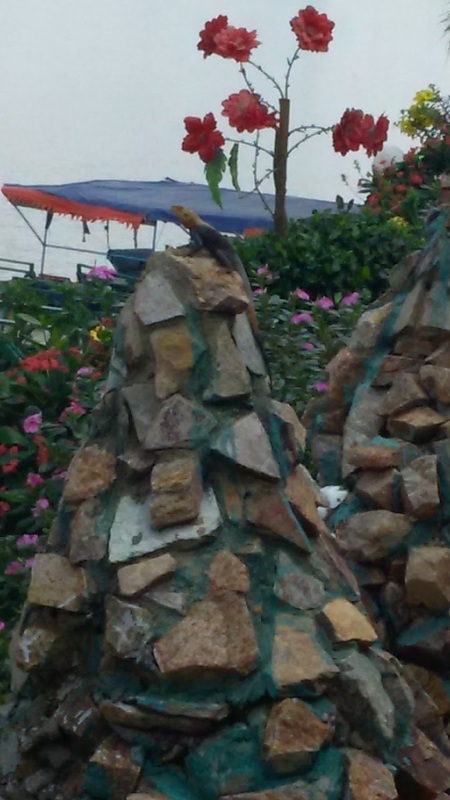 He appeared to be about 60 or 70 years old. 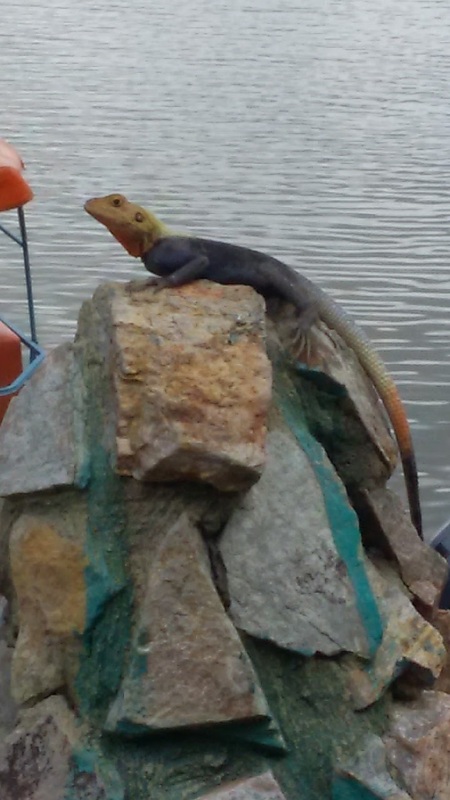 If he wasn't, then his knowledge of the river and the state of the local environment downstream from the Akosombo Dam must have been gained from the lore of those who were that age and older. Once we were out in the river and a mile or two south of the Spa, Amos cut the engine, stood from his seat at the wheel, and offered us a natural history of the Volta. 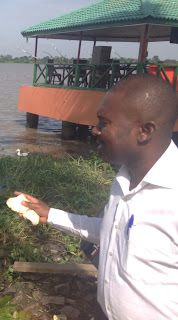 Amos reminded us of the series of tilapia farms we had seen along the way to our current location. 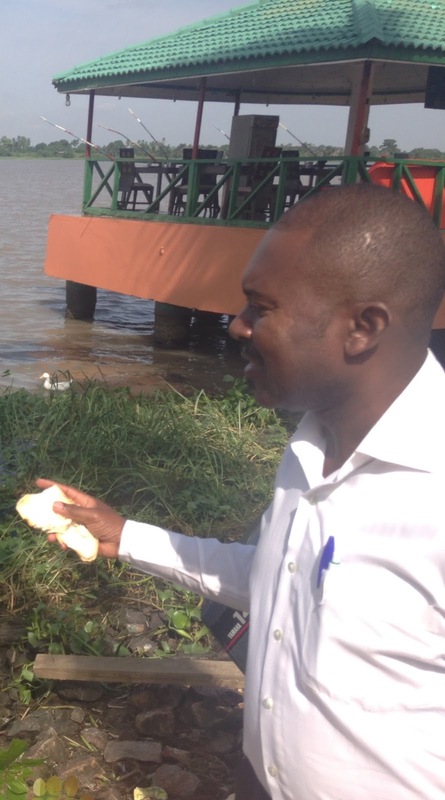 Tilapia is the favorite freshwater fish of Ghanaians, he said. It is easily reared and bred, and grown and fed cheaply, and so it is very popular as well among those who farm them. Sadly, tilapia is not grown in the best or cleanest environment, since the Volta after damming became muddy and, in places, infested with strains of bacteria that can be harmful to animals and plants. "There was a time before the dam when, anywhere along the river, the water was so clear you could see straight to the bottom at any depth. After it became muddy, the English brought the water plants you see floating in the river to prevent erosion and absorb the toxins from the bacteria. These plants included or attracted species of snails that kept the weed from overwhelming the river but which brought with them new, more virulent bacteria. The English also set up water treatment plants, but these have not been maintained to the highest standards. You may notice that there is an odor to the Volta, and this is why. This is what the Dam has done. The other problem the dam has brought us is sudden flooding when rains upstream make it necessary to open the sluice gates. Entire villages have been washed away at times, but every rainy season somebody suffers." This bleak natural history at an end, Amos resumed his seat at the helm, piloted us past "the longest bridge in Ghana," turned us around, and headed us back to the Holy Trinity. Despite this sad testimony, we had to admit that this was nevertheless a lovely day and that the sights and sounds around us were fascinating. Gershon was waiting for us when we came ashore and, after having a good laugh when the hospitality manager offered hospitality to the Spa's flock of ducks, again in the form of a large loaf of white bread, he spirited us away to Evans and the waiting van already loaded. Three hours later, we were upriver enjoying lunch at the Volta Hotel on a bluff in full view of Akosombo Dam. This would set the scene for the next portion of our day - a tour of the very dam Amos had been damning, that morning. Kweku told us that Akosombo Dam was one of a number of water-powered projects along the rivers Volta conceived in the early 20th Century by the geologist and naturalist Sir Albert Kitson who had just previously also discovered bauxite deposits in the region and imagined that the dam could be used to power an aluminum smelter. Interest in such a project was invigorated during the 1940s when Kitson's notes were rediscovered by the Gold Coast government, Ghana's British colonial administration. Just after independence, Ghana's first president Kwami Nkrumah discussed with our own President Eisenhower the potential for an American aluminum company to work with Ghana to fulfill Sir Albert's imagining. The company Kaiser Aluminum was eventually recruited, forming a new company, Valco, which built the smelter at Tema. When the turbines began turning in 1965, eighty percent of the power was directed at the smelter. The remaining twenty percent was distributed through high tension wires across southern Ghana, Togo, and Benin. 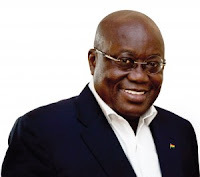 Ghana's portion provides about sixty percent of the electric power required by the country. the primary component of the dam structure. Kweku told us all this, while seated beside me in our van. The rainy season of Ghana was having its way. There was a gentle but persistent downpour, and we decided to wait it out before touring the top of the dam - a road across which light vehicles and maintenance equipment could travel with ease but which we had to traverse on foot. About twenty minutes later, the steady rain became a sprinkle, and we proceeded out, to see this wonder of engineering. Sir Albert Kitson had recognized that the steep and narrow gorge formed by the river at Akosombo, if dammed, could harness the power needed to industrialize the Gold Coast. Some enterprising Italian contractors recognized that this could be achieved cost effectively and simply by filling the river's channel with rubble blasted from the walls of the gorge. Water intakes are visibly active at two of the generating stations. The power plant includes six turbines that when combined can generate as much as 1,020 megawatts of electricity. Customarily, only two or three are online at any given time, to allow for maintenance on the others. Kweku noted that low water levels may sometimes limit output and observed further that global climate change, including diminished rainfall in West Africa, has contributed to this decrease. I wondered at this, since Amos that morning had indicated that high water levels on Lake Volta were what had triggered approximately annual spills into the lower Volta and had frequently ruined villages downstream. Kweku responded that the last massive spill had happened after an unusually heavy rainy season in 2010, followed by the highest Lake Volta water levels ever recorded. This had done some harm especially to the villages where displaced people had relocated - a painful irony, since they had been moved to their new settlements in order to avoid the flooding above the dam. But the VRA, he insisted, was on the job, and the spills since had all been done in a carefully controlled fashion, to avoid the kind of hardship that was created in 2010. As we walked the road across the top of the dam, Kweku pointed out a number of things visible from our position. There was Peduase Lodge, a presidential retreat built on the mountain that was facing us in 1959 for Osagyefo Dr. Kwasi Nkrumah - isolated and accessible only by a military road or by helicopter. Peduase Lodge fell into disrepair with disuse during times when reform was the central focus of government, but in 2001 it came to be recognized again as a potential resource for diplomacy (as it had been in 1967 the site of negotiations to end the Biafran War in Nigeria) and as a safe retreat for Presidents and their staffs. Kweku said that he very occasionally sees the presidential helicopter alighting there and knows "the eagle is in his nest." There was a bright yellow pier jutting out from Dodi Island just north of us. It was emptied about five years ago of its pleasure boat, the Dodi Princess, which would cruise Lake Volta full of tourists and party-goers. Sadly, the boat caught fire while docked and had to be towed away for repairs. All the Ghanaians in our group spoke of their high hopes for its return soon. 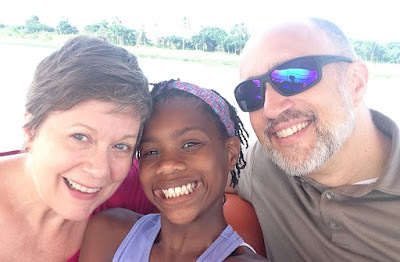 After our tour, we returned Kweku to his office and continued on our journey, to Hohoe - our host Gershon's hometown - where he would be united with his bride Pamela and we would be introduced to her, and the Kikis Court Hotel would our next home away from home. Sunday: Akwasi, Kwasi, Kwesi, Akwesi, Sisi, Kacely, Kosi. Monday: Kojo, Kwadwo, Jojo, Joojo, Kujoe. Tuesday: Kwabena, Kobe, Kobi, Ebo, Kabelah, Komla, Kwabela. Wednesday: Kwaku, Abeiku, Kuuku, Kweku. Friday: Kofi, Fifi, Fiifi, Yoofi. 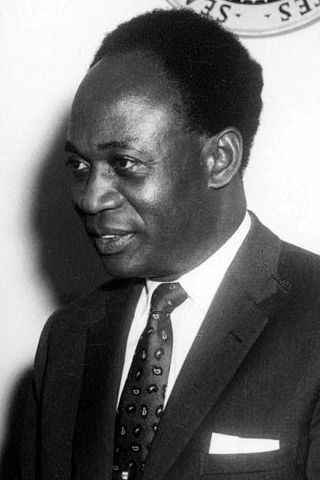 President Nkrumah was unseated in a 1966 military coup, and the resulting government was propped up by Western powers bent on profiting as much as they could from the country's raw materials and natural resources, like the bauxite, manganese, and diamonds Kitson had discovered but also the gold, tropical fruits, exotic animals, cocoa, coffee, and sugar for which Ghana was already famously exploited. The corruption in government grew to such an extent that only a reform-minded military officer could have hoped to overthrow it, and Jerry Rawlings did exactly that in 1981. But Rawlings has repeated, in and out of office, the lament that Western industrial countries have consistently through economic isolation prevented Ghana (and the rest of West Africa) from developing profitable working economies of their own. African countries may sell raw materials, President Rawlings has noted, but these sales are at prices the Western companies set. And when manufactured goods made of those same raw materials (fabric, appliances, automobiles, canned goods, and so on) are sold to Africa, they come at steep prices associated with the labor and other manufacturing costs of the West. Between Africa's precipitously low wages and cost of materials and the contrastingly inflated prices associated with manufactured goods they must buy if they expect to go from place to place, communicate electronically, or even just to wear clothes, the people of these countries which make possible the rest of the world's useful goods are crippled in their household finances and their governments hobbled and their economies left in ruins. Then, any corresponding step Africans may take to remedy the situation (for example, restructuring their systems of government and consolidating or centralizing economic power through the nationalization of commodity production), President Rawlings continues, is interpreted by Western governments as totalitarian or communistic and therefore anathema to democracy or capitalism. Cries of corruption are lodged and African states are destabilized by globalist corporations, and truly corrupt politicians or military leaders are ushered back into power for the sake of maintaining stability of Western businesses. Breakfast at the Holy Trinity Spa and Health Farm, just as at the Coconut Grove in Elmina, is served at an open-air dining space. Unlike the Coconut Grove, however, the Holy Trinity's dining area has a television mounted on a bracket just inside the entryway and, while we were there, piping CNN news or the Federations Cup. Also unlike the Coconut Grove, breakfast was always pre-assembled and waiting for us under cover. On the Saturday we arrived we had not yet had breakfast, so the hospitality manager asked us what we would like, perhaps a full English breakfast. We said yes then, and on Sunday and Monday also, sensing by then that we really did not have very many options. The Holy Trinity full English breakfast would include a two-egg omelet seasoned with what appeared to be scallion and bell pepper. This was served beside baked beans and what passed for sausages but looked like hot dogs that had been scored for effect. As I write this now, some weeks later, I seem to recall there being a small serving of sauteed mushrooms also. A side plate included a selection of fresh mango and orange slices, sometimes papaya or watermelon. Additionally on the main plate would be two perfect slices of white bread, slightly stale, as if stiff bread was somehow the same thing as toast. Driving about we would almost always see at street corners women selling the kind of loaves from which these slices had been cut - long and rectangular (or square if you looked at them edge-on) and with a faint yellow crust in clear plastic, stacked in piles impossibly deep either at the roadside or in massive basins on the women's heads. The Holy Trinity had a refrigerator situated on the pier between tables overlooking the river and facing the television. Its top shelves were populated by loaf after loaf of the stuff. I only ever saw it served for breakfast until this morning, so why they needed so much was a bit of a mystery. Then, there was the matter of the coffee. The day we arrived we had been greeted by an office worker who asked whether we would perhaps like an espresso or cappuccino after such a torturous night and subsequently long morning on the road from Tema. Coco and I gratefully accepted, and Gwen was provided hot cocoa, from a machine that seemed very similar to the coffee machine that had greeted us at our hotel in Paris. It took a while for the beverages to arrive, though arrive they did and happily. Strangely enough, we learned that the pause was due to the fact that the machine had not been turned on until we arrived. This morning, as we passed through the lobby on our way to breakfast, I asked whether we might again enjoy a cup of cappuccino. After a similarly long period, it was served - again, I presume, because they had not turned on the machine before I made the request. 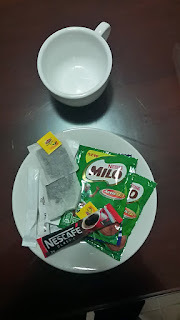 Once we were on the pier and seated, we discovered that our table was supplied with a plate full of Nescafe packets and a pot of hot water. A small pot of semi-skimmed milk was there also and a bowl with sachets of sugar. From this moment forward in Ghana, this sufficed as coffee. Each morning but this one, we would have breakfast as a family alone on the pier. This morning, however, a rather important looking man appeared. He wore a white dress shirt open at the collar, slacks, and loafers. Attending him were two members of the staff. Once he had been seated, at the table on the other side of the refrigerator from us, the first staff member exited after a quiet exchange of words. As soon as the first was gone, the second - a man who did not appear to be Ghanaian but, rather, Indian or Sri Lankan as I observed his skin tone and hair texture - produced from behind his back a small tray with items for shaving on it. There was a soap for making foam and a brush for mixing and applying it, as well as a straight razor and a towel. He placed the towel over the other man's shoulders, mixed the foam, and applied it to his head and face. He then proceeded to shave the important looking man. When he was done, he wiped the remaining foam with the towel until the man was gleaming and stood aside at comparative ease. In a moment, the first staff member appeared with the important looking man's breakfast. As you may have seen from yesterday's post-ending video, there are ducks - white and mallard (?) - that live at the Holy Trinity. 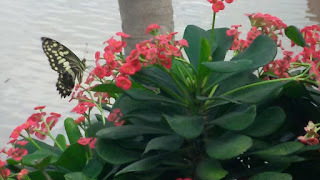 They are very interested in the human breakfasts that happen on the pier, since, it appears, one of the reasons for having meals in that open-air, watery setting is to provide for an easy method of waste disposal. Servers empty unfinished plates over the railing of the pier and into the Volta River. These ducks are very fond of this practice. I noticed, they seemed very well acquainted with the important looking man, and made quite a fuss in the water while he was being shaved. During his breakfast, he looked over at me with a twinkle in his eye and said something in the local dialect to the first man, who went to the refrigerator and withdrew two of the loaves of bread from it. He handed one loaf to the important looking man and unwrapped his own, as the important looking man unwrapped his and stood up from his chair with his napkin still attached at his collar. This now got Gwen's attention because the waterfowl were making such a racket. Each of the men broke their loaves and chucked first one half and then the other as far as they could out into the river. A huge commotion ensued as the ducks swarmed upon sinking loaves. Laughing at the sight, the important looking man sat back down and returned to his breakfast. Gershon arrived, a moment later, to take us to church with him. We lingered for a bit, waiting for Gwen to finish her breakfast and Coco and me to empty our coffee cups. Then, Gershon said that he learned worship had already started at the church in Sogakope. So, we exchanged waves with the man and his attendants, and off we went. "By the way. Do you know who that was having breakfast on the pier?" I asked Gershon when we were in the van. "No, I haven't any idea," he said. "But he seemed to recognize me." more formally than when we saw him. I said that I had thought he might be a local chief or, perhaps, a government executive. His round features and gleaming face reminded me of President Akufo-Addo. "No, I don't think so. 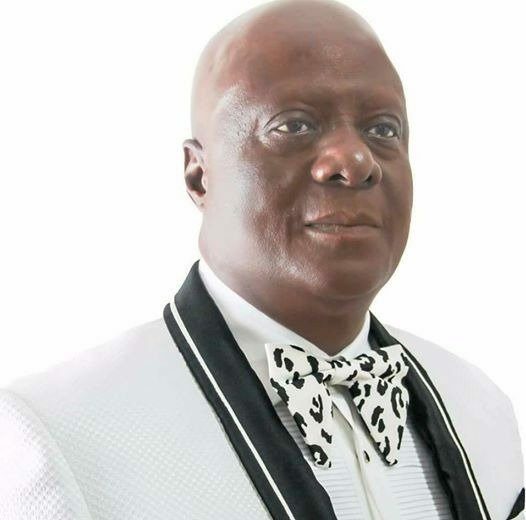 I don't know who he is, but I am pretty certain he isn't in government," said Gershon, and we continued on to join Sogakope's Evangelical Presbyterian Church already in progress. The next night at dinner, the hospitality manager asked me, "Are you a pastor?" I said, "Yes, I am. And so is Rev. Dotse who has been showing us around." "My boss thought you might be," he said. "He thought you had the look of a pastor." "Your boss? Dr. Anyah? How am I acquainted with him?" "Why, you and he both had breakfast at the same time, yesterday. That was when he saw you and your friend. He said to tell you he is honored to have you stay at the Holy Trinity." "Well, please tell him that I am sorry we had to leave in such a hurry. But we are honored as well, to be here." We did indeed arrive about fifteen minutes after worship had begun at Sogakope's E. P. Church. Music was playing and the congregation singing as we approached the building's covered porch. Deacons stood at either side of the door to the worship space which was barred with a two-by-six plank until they saw us and removed it. The custom is to hold the crowd during the individual movements of the service, but to seat latecomers only when an informal moment arises after the opening of worship; hence, the board. Gershon said that he did not plan to ask for a place of prominence since we were late arriving, but did I want to be seated in the chancel? I said no, I agreed with him, and so one of the deacons showed us to a pew slightly more than halfway up that was empty enough to accommodate us. It had three women seated in it, who moved to the other end as first Coco, then Gwen, then I made our way in. Gershon sat next to me near the end. Evans had dropped us off in the lot and then gone on to find parking. He appeared, a few minutes later. But by this time, our pew had taken on a couple more people at Gershon's end, so he stepped up to the next pew, where he was invited to sit between a couple of apparently eligible women who seemed delighted to have our handsome young driver crowded in the midst of them. At one point in the service, one of them even put her arm around him over the pew back, one supposed in order to make more room but maybe not. The congregation was singing a hymn when we arrived which seemed familiar. When it ended, I remarked to Gershon that, had I been singing it back home, it would have been "Higher Ground." He said that, had I been able to sing in Ewe, I would have been singing that also. A tall young woman stepped to the lectern and read a prayer. Gershon told me all the different purposes for which she was praying. After she said "Amen," Gershon told me that she was inviting the choirs of the church to sing. The first choir to assemble was the chancel choir - about thirty men and women, all in liturgical robes. Some of the women wore turbans, some scarves, and some wore mortar boards. I asked Gershon whether they were students. He said, "No. In the E. P. Church we try to emphasize the equality of all people regardless of gender. As a result we have many women in prominent positions in the church. You noticed that the liturgist here is a woman, and her head is uncovered. But we have not been able to shake the idea from some that, despite Paul's admonition in First Corinthians, they do not have to have their heads covered. And in every church choir I know, the women wear head coverings. If they do not arrive at church with something on their heads, we always have mortar boards available for them to put on. And so that is why they're wearing mortar boards." "No, no kidding," he said. And, I will tell you, sure enough: All but two church choirs I heard and saw which included women did indeed have every female member with her head under wrap. The two choirs that did not were contemporary music choirs whose female members, in their twenties, had forgone either scarf or mortar board. A recording of the contemporary music choir at Sogakope is included at right. You can't see them, but these women are uncovered. During the anthem, a tall thin woman suddenly appeared in the aisle at the other end of our pew. By now, most latecomers such as ourselves had arrived, and most of the seating was taken but not all of it. Certainly, our pew was full. She nevertheless indicated to the three women at the far end that she desired to take a seat between the nearest of them and Coco. She was quite insistent, wedging her thin self into the scant space and practically sitting on my wife as a result. I scooted closer to Gershon and Gershon to the men at his right, and Coco with a look of bewilderment and frustration did her best to make room as the woman proceeded to assume as much space as she could. When the chancel choir had finished, four more choirs were invited to sing their portions of the service - a junior women's choir, a mixed choir of young women and men, a senior women's choir, and a men's choir. In the case of the first, not only did they sing, but as they sang, the congregation came to their feet, clapping the rhythm along with the drum and tambourine. And then one of the senior women began dancing. Others stood and joined her. First, they danced in their places, then they emptied out into the aisles and danced in front of the choir. Before long, they persuaded a young couple dressed in white and seated on the front row to get up up and dance with them. Soon, more people in the pews were dancing and making their way into the aisles. For ten or fifteen minutes this went on. The dancers returned to their seats after this, although much dancing ensued during the time of offering as people brought gifts forward. Looking to my left as I stood with my fellow pew members, I saw what I expected: Gwen overwhelmed with the volume of the song, as surreptitiously as she was able, working her hands up to her ears to dampen the sound. Seeing this too, Coco drew her close so that only one hand might be needed. When the song was over and we were seated again, Gwen seemed a bit more comfortable, but I noted to Gershon that when an opportunity presented itself we ought to see if Gwen and Coco might be able to observe the rest of the service from outside. It was heating up with all the energy and the process of the day toward noon, not to speak of the unwelcome worshiper who was practically on Coco's lap, and even with ceiling fans turning at full I knew Coco probably would need to step aside too. Gershon said that the offering, which was coming up after the men's choirs had sung, would provide such an opportunity. We would walk up with our offerings, and we could exit out the side. The E. P. Church is not a big denomination, and it suffers from a lack of ordained ministers according to the number of churches there are to be served. This combination of circumstances results in the fact that, when an ordained minister visits a congregation, it is not unusual for him to be recognized. Here in Sogakope, if the Rev. Gershon Dotse was hoping to avoid notice he was bound to be grossly disappointed. For the pastor of the Sogakope church was a classmate of his at Trinity Theological Seminary in Accra. Therefore, proceeding to the front for the sake of making an offering, Gershon was noticed. The pastor, who also arrived late for the service (He had been elsewhere for the morning, present at one of the three other churches he also has charge of. ), was entering as Gershon and I were escorting Coco and Gwen out to a shade tree in a courtyard near the church. To Gwen, we offered the chance to attend Sunday School in a nearby out building, but she elected to stay with Mom in the shade. Meanwhile, Gershon and his friend were falling all over each other with joy at meeting again. It appeared that our host's return had not been much publicized. Now, it would be impossible for us to return to the row behind Evans and his bevy of interested eligibles. The pastor insisted that we must sit up front with him. Chairs were brought, and there we sat, as the music for the offering ended and the stands for the offering were removed from the center. The liturgist announced, by Gershon's translation, that scripture would be read. As she announced the names of the readers, four rather confused looking people came forward. "Apparently, they didn't know they were expected to read," I was told, but I was also assured that, finally, I would be able to hear something in English, since the third reading of the day was to be in a biblical version other than Ewe. The confused readers persevered through their readings, even the one who was not reading in Ewe. Unfortunately for me, however, the passage was not in English but in Twi. As the readings continued, more chairs were added to the chancel, and now people who looked like dignitaries were seated with us - a middle aged man in robes of kente cloth, an older woman decked in pale blue whom another man presented almost ceremoniously with a paperback book that had his picture on the back of it. Now, the preacher - a lay member of the congregation - arose. And, although his sermon was surprisingly brief (perhaps ten minutes) and although he infused his message with much humor, and although Gershon said that he thought for sure there would be some translation provided, the Spirit's guidance was offered in Ewe only. "I will tell you later what he said," Gershon promised. The service drew to an end. Community announcements were made, including an invitation, as I understood it, for people to remain for a talk by an inspirational author who was present. The pastor was introduced by the liturgist, and he then introduced "Osofo Gershon 'Doochay'" to the congregation, who immediately applauded with much enthusiasm. Osofo means "Pastor"; Doo-chay, it turns out, is how Gershon's surname (Dotse) is actually pronounced. Gershon, in turn, invited me to join him and introduced me, "Osofo David Denoon." This elicited a surprisingly widespread intake of breath and subsequent "Aaaah!" and a fair amount of murmuring. Gershon and the pastor both explained to me at the same time that there is a very popular minister in the E. P. Church with the same last name as mine. Now it was my turn to gasp and say, "Aah." I said that I had not known I had relatives in Ghana but that I would be interested to know him and find out whether we are in fact related. Then, I turned to the church and with Gershon's help (translating) told them the purpose of my visit - renewal and a bit of adventure. Everyone seemed very approving of my interest in adventuring, especially in Sogakope. Gershon then excused us, and we bade a hasty exit as the pastor introduced the speaker. Meanwhile, out under the shade tree, Coco and Gwen had been amused by a little girl who was playing near them. She was maybe three years old and, after much wandering around the grounds but refusing to attend Sunday School, she had become much enamored of a pile of rubble just on the other side of my family. Mother and daughter, it turned out, were seated just beyond the worksite where a new parsonage was being constructed in the church compound. So, the stuff in this pile were odds and ends from the building. Eventually the allure of the rubble wore off, and Coco caught her attention. Or, it would probably be more precise to say, Coco's relative pallor caught her attention. Coco says that, while in conversation with Evans who had managed to give the slip to the women in his pew, she suddenly became aware of a presence beside her. It was the little girl, staring at her arm with her mouth gaping. "Hello," Coco said gently. The girl now looked up at her face, still reflecting a fearsome awe. As she did so, Coco turned her right arm over to reveal the still more pale underside of it and stroked it with the fingers of her left hand. The girl seemed genuinely alarmed, possibly wondering what affliction would cause her to become so pale and her hair to straighten. Evans at first tried to explain that Coco was from a far away country where many people are her color, but he was speaking in Twi rather than the local Ewe. So his explanation made no sense to her. By this time, the girl had been in my family's vicinity for almost an hour, and no one had come to check on her. Coco wondered aloud whether her parents might be in the sanctuary but didn't know how to call for them. Evans tried to ask around about the girl, but no one seemed to know who her parents might be. At the same time, no one appeared worried, either, especially not the little girl... except about Coco's frightful lack of melanin! I, of course, want to be able to say that Christian community can include everybody, enough to rest assured that belonging will be a quality ascribed to all among you on any given day. Still, it would have been nice to find her parents or older siblings or somebody who knew her, just to ease our consciences from having driven off at the end of worship. Gwen would spend the rest of this day with her new friend Jennifer. Jennifer would take her around the grounds, showing her the stables and the snack bar (which includes a wet bar that not surprisingly overlooks a threatening-looking crocodile enclosure!). Jennifer even served her an orange Fanta - Gwen's staple beverage during our time away. Gershon offered to take me to an evening service at Sogakope's E. P. Church but, upon finding out from his friend that the night would just be a lay-led music service, elected instead to take advantage of the pastor's hospitality and grant me a quiet evening. Pastor Dave Denoon's "Post Pastoral"
The content included as part of this weblog consists only of the opinions and insights of the Rev. David Denoon, and not necessarily of members of the First Congregational Church of Webster Groves. Though he can always hope so! Thanks for reading (and commenting)! Rev. David A. Denoon, 2012. Simple theme. Powered by Blogger. SEEK CHRIST IN EACH. SERVE GOD IN ALL.